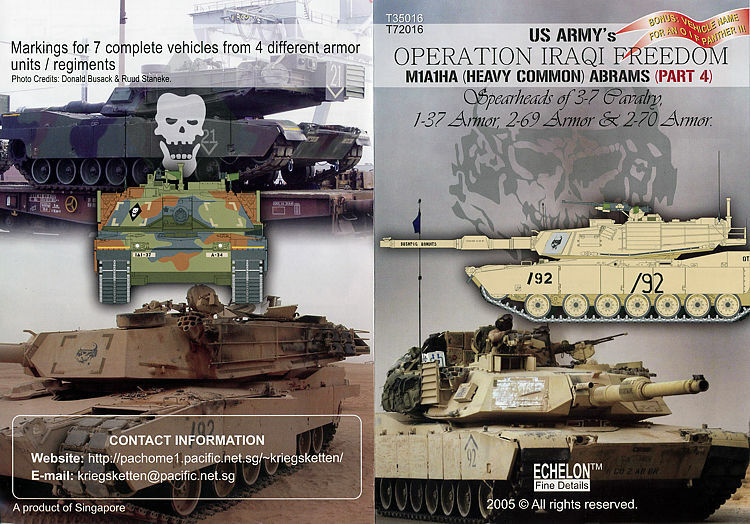 1-37 Armor, 2-69 Armor & 2-70 Armor"
Echelon must think that there is no such thing as "too many OIF Abrams" decals! The set reviewed here is their sixth (!) set with markings for M1A1HC tanks participating in Operation Iraqi Freedom and fourth set of US Army Abrams tanks markings. Considering that each Echelon set contains complete sets of markings for at least six vehicles, in total with six decal sets we can now build 39 various OIF Abrams gun tanks!!! 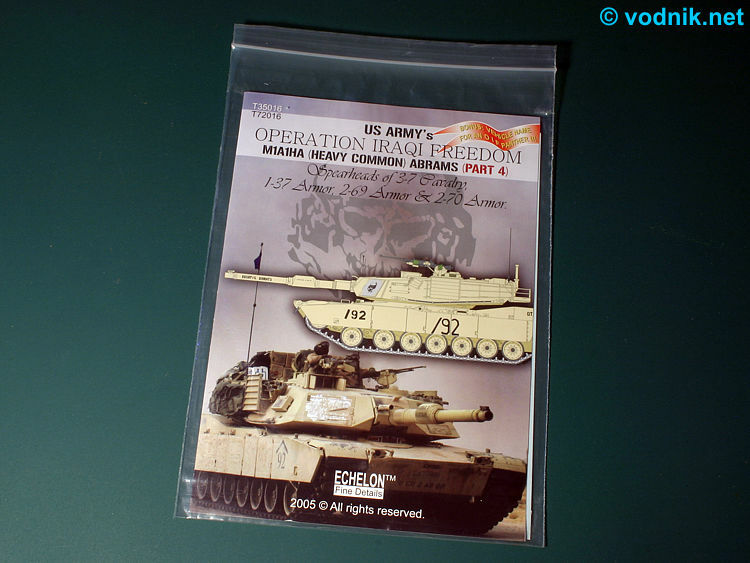 In new T35016 set featured are seven M1A1HC tanks, for which as usual we get full set of markings plus as a bonus included are vehicle name decals for M1 Panther II mine clearing vehicle also used in OIF. Decals are packed in plastic zip-bag with one decal sheet (approx. 120mm x 190mm) and two-sided full color A4 size instruction sheet folded in half inside. 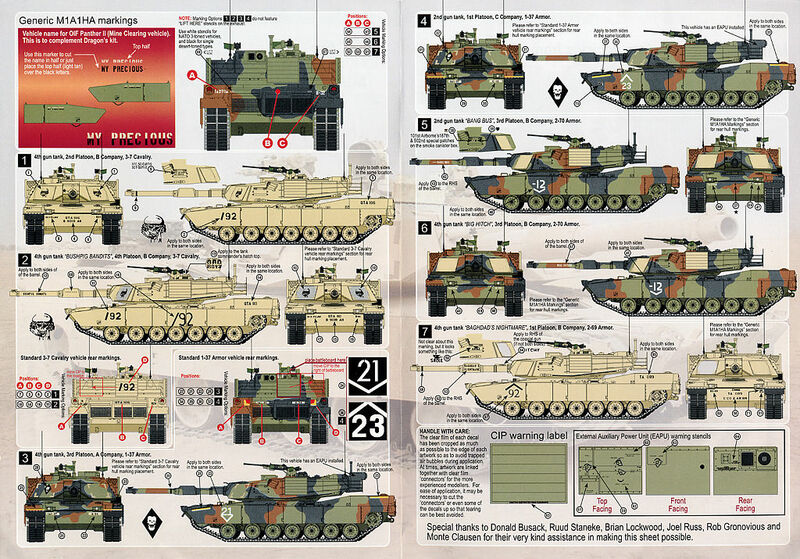 Instruction sheet includes three photos of some of featured tanks and very clear decal placement diagrams. Decals are printed by the Microscale Industries and as can be expected print quality is top notch. All the tiniest stencils are legible. All color markings are printed in perfect register. are photos of featured tanks. Click on picture to enlarge it. Instructions are very clear and precise. Eighth featured vehicle is "MY PRECIOUS" - M1 Panther II Mine Detection and Clearing Vehicle from 9th Engineer Battalion. 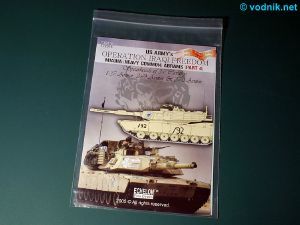 For this vehicle we only get two-piece decals for the tank name, as it is meant to complement other decals included in Dragon kit for this particular vehicle (this means that modelers using Trumpeter kit of Panther II will not have the rest of needed markings for this machine). 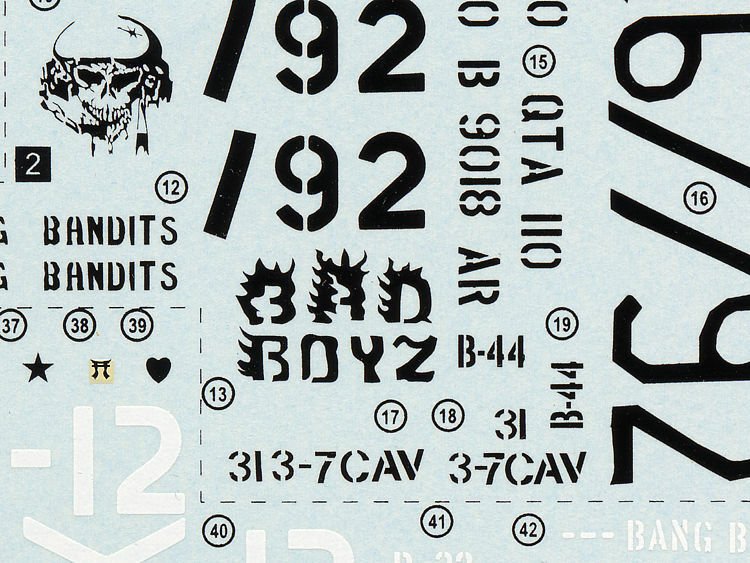 For seven featured gun tanks we get complete set of markings with all stencils repeated at least seven times on the sheet. As a bonus we get a number of generic letters and digits in two sizes, plus tan rectangles - all this to make custom "bumper codes" for other tanks than those featured in the set. 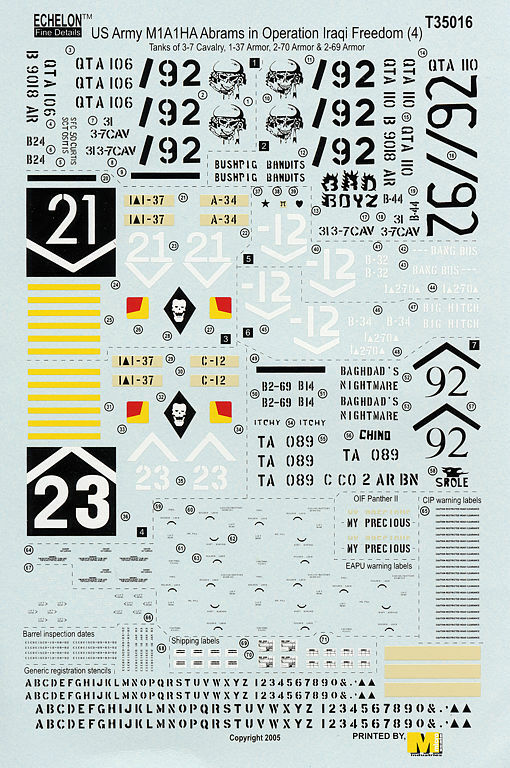 The assortment of generic stencils and labels provided on the sheet is similar to one provided in other Echelon M1A1 sets. 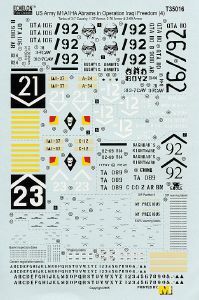 Included are five sets of stencils External Auxiliary Power Units (EAPU), although only two of featured tanks are shown in instructions with EAPU attached. This time for Combat Identification Panel we get only frames stencils, but not "THIS SIDE OFF" markings for deactivated CIPs which were added to some of previous decals sets. 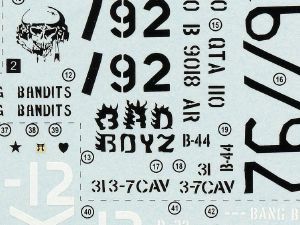 There is a number of shipping labels provided, plus barrel exercised date stencils and "lift here" markers printed in two versions: black and white. I was able to find photos of most featured tanks in my reference collection and all the markings seem to be perfectly reproduced. "BAGHDAD'S NIGHTMARE" tank has a small marking on a smoke grenade storage box, which Echelon designer deciphered as "SROLE", although they admit in instructions that they are not certain that it is correct. While the only photo I know showing this marking is the one on the first page of Echelon set instructions and I cannot tell for sure what the marking really was, it seems quite likely that it could have been in fact "EAGLE". Letters "S", "R" and "O" can look very similar to "E", "A" and "G" on low resolution photo. But it is possible that Echelon have some more clear photo that indeed show the "SROLE" text (maybe someone's last name?). Once again Echelon gave us excellent decal set. It is particularly interesting, because this is first set from this manufacturer including markings for US Army tanks in NATO camouflage for some variety. All three previous Army sets were for 3rd ID tanks and they are all painted in desert tan. 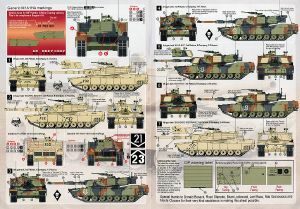 Featured tanks from 1-37 Armor carry full standard USAREUR markings, so while they can of course be used to depict tanks from this unit during their OIF deployment, they can just as well be used to make a model of a tank in training in Germany! Very nice bonus included in the set is the name for M1 Panther II - it was big Dragon's omission not to include it in their kit, but luckily Echelon filled this gap! Many thanks to Lawrence Goh of Echelon Fine Details for the review sample.